In addition to a variety of different guitars David got a new smaller Pete Cornish board that he used on the recording sessions together with the Hiwatt amps and Yamaha rotating speakers. His raw and aggressive tone suited the album’s dark sound and it also feature some of his finest work. The huge scale of the stage production required two setups – one main setup consisting of the Animals amp rig and Pete Cornish board and a smaller rig that was used during the second half of the show in front of the wall. Pedal board effects listed as in chain. Note: The board dates from February 1979 and although it’s described as David’s studio board he might also have used single pedals during the sessions notably on early demo sessions. David's second Pete Cornish pedal board dates from February 1979 and was used for the main part of the Wall recording sessions. 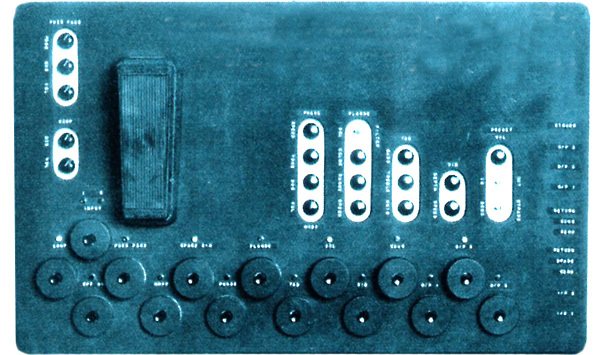 The board was later used on the Division Bell recording sessions and by Tim Renwick on the 1994 tour. Note: This board was originally designed in early 1976 for the Animals recording sessions and tour and was also used on David’s first solo album in 1978. 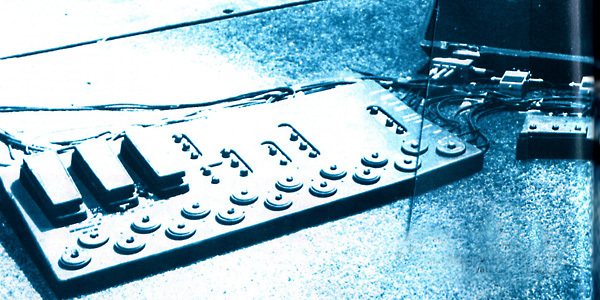 The board was used as David’s main stage board for the Wall tour. For a wider stereo effect the signal out of the board was split and fed through two Boss CE2 chorus pedals. 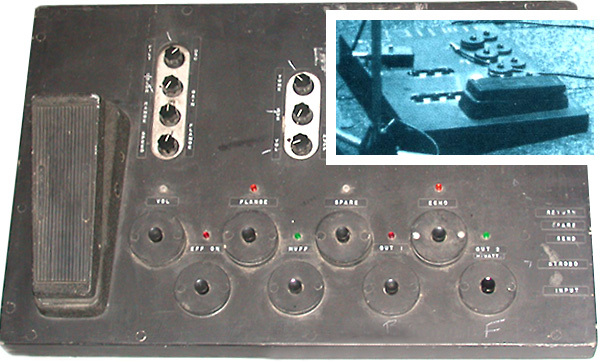 David's main pedal board on the Wall tour was originally constructed for Animals recording sessions and tour in 1976. The board now featured a couple of updates including a Big Muff, Electric Mistress and Pete Cornish ST-2 overdrive. Notice the two Boss CE2 chorus pedals to the right of the board. These were used for the split signal out of the board creating a stereo effect. David, Snowy and Roger each had a mini board constructed by Pete Cornish that were used during the second half of the show when they performed outside the Wall. David's board featured just a Big Muff, Electric Mistress, volume pedals and send/return for the delay. The inlay shows the board with a switcher pedal on top for the MXR Digital Delay. David had three different pedal boards for The Wall. Pete Cornish made him a new board for the recording sessions and the mini board that were used while playing infront of the wall during the second part of the show. Davidâ€™s main board for the show was an updated version of the Animals board. All three boards had two inputs for each guitar and three outputs for each of the amps. The signal is fed into the board and divided into a Conn Strobo Tuner and a master bypass. The main signal is then fed through a filter that equalizes the input/output volume to avoid any signal loss and match all effects. See this feature for more on David’s Pete Cornish Animals pedal board. – 1969 black alder body with a black pickguard, Charvel flamed maple neck and Fender 1971 neck and middle pickups and a DiMarzio FS-1 bridge pickup. – 1955 model with Gibson P-90 â€œsoapbarâ€ pickups. – Run Like Hell recording sessions. – 1959 three colour sunburst alder body fitted with a custom Stratocaster neck pickup and rosewood neck. – Comfortably Numb recording sessions with high octave tuning. – with Mullard 4xEL34â€™s power tubes and 4xECC83â€™s pre-amp tubes. – with 4Ã—12â€ Fane Crescendo speakers. 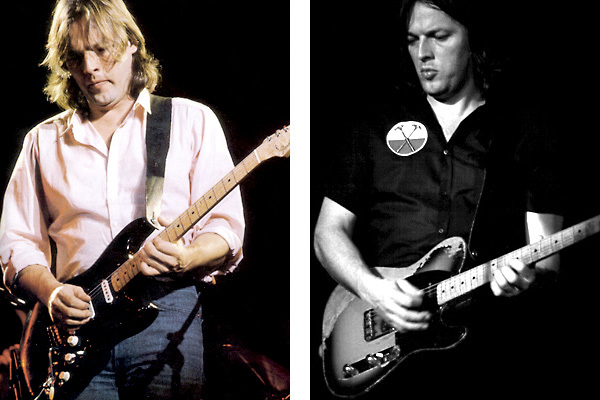 David's two main guitars for the Wall live shows - The Black Strat, now featuring a Charvel maple neck and a custom wound Duncan SSL1 bridge pickup and the 1955 Fender Equire fitted with a custom Duncan neck pickup. 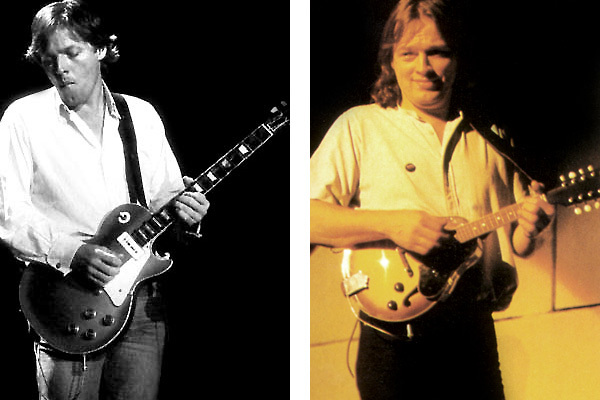 (left) David used a Gibson Les Paul 1955 Gold Top for several songs during the first half of the show including Another Brick in the Wall (part 2). (right) David playing a mandolin during the shows finale after the Wall was torn down. – 1969 black alder body with a black pickguard and Fender 1971 neck and middle pickups and a Seymour Duncan custom SSL-1 bridge pickup and a Charvel flamed maple neck. – 1955 sunburst ash body with black pickguard and maple neck. Fitted with a custom Seymour Duncan Stratocaster neck pickup. Used on Run Like Hell with dropped D tuning. – 1955 model with Gibson P-90 soapbar pickups. – 1959 sunburst body with stock Fender pickups, white pickguard and a 1963 rosewood neck. This was used as a spare. – Flamed sunburst body with binding, Filtertron pickups, tremolo bridge and a Charvel maple neck. Probably used as a spare. – with Mullard 4xEL34â€™s power tubes and 4xECC83â€™s pre-amp tubes (one head was a spare). Modified for linked normal and brilliance inputs. – 4Ã—6L6 and 2Ã—12AX7 tubes. The amp was used for boost and distortion. CLICK FOR BIGGER IMAGE. 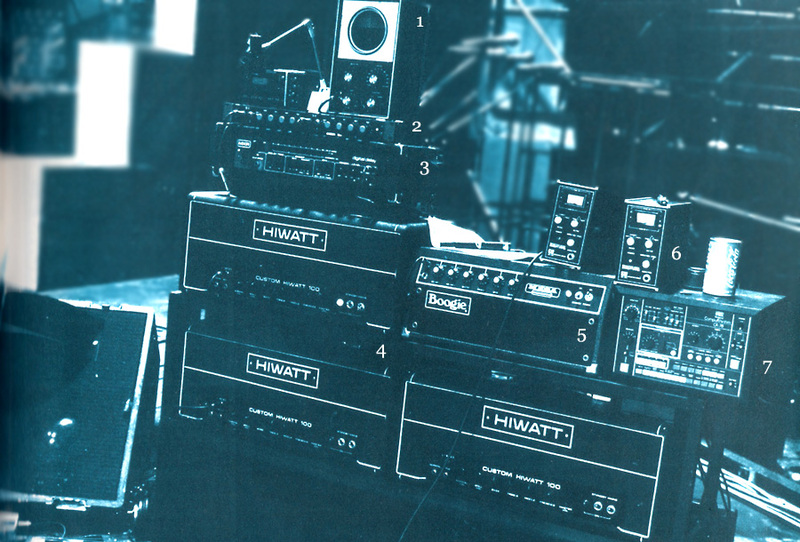 Davidâ€™s main rig for Wall live performances: 1. Conn Strobo tuner, 2. Alembic F-2B tube preamp, 3. MXR Digital Delay System I, 4. 3 Hiwatt DR 103 100w heads (the one to the right is a spare), 5. Mesa/Boogie Mark I 1978 head, 6. 2 Chaeffer Vega Wireless System transmitters, 7. Roland CR-78 Compurythm metronome. – with Mullard 4xEL34â€™s power tubes and 4xECC83â€™s pre-amp tubes. Modified for linked normal and brilliance inputs. Note: This second smaller rig (one Hiwatt head with one WEM cab) was used while the band performed in front of the wall during the second half of the show. David used Herco and Guild heavy gauge teardrop picks. All electric guitars were strung with Ernie Ball (Stratocaster 0.10-0.48/ Telecaster 0.10-0.44) and acoustics with Gibson Sonomatic E340L. Speaker cabinets were mic’ed with Shure SM57 microphones. See these in-depth features for more on David’s gear: Pete Cornish Animals Effects Board, Big Muff, Electro Harmonix Electric Mistress, The Black Stratocaster, The #0001 Stratocaster, Telecasters, Slide Guitars, Alembic F-2B preamp, Yamaha RA-200 and Hiwatt amps & WEM cabinets. The Wall (album 1979), Is There Anybody Out There The Wall Live â€˜80-â€™81 (album 2000), 1979 The Wall demo tapes, Guitarist Magazine (â€œRelicsâ€ 1995), â€œIn the Fleshâ€ by Povey/Russell, â€œComfortably Numb â€“ A History of the Wallâ€ by Vernon Fitch and Richard Mahon, â€œThe Black Strat â€“ A History of David Gilmourâ€™s black Fender Stratocasterâ€ by Phil Taylor. Thanks to Richard Mahon, John Roscoe, Rafal Zychal and Pete Cornish for for help with research. See feature for other references.